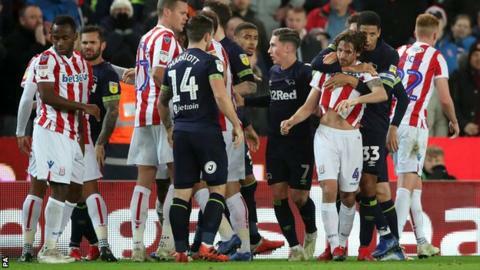 Stoke midfielder Joe Allen says he was not bitten by Derby's Bradley Johnson when they clashed during the Potters' 2-1 Championship win on Wednesday. Johnson grabbed Allen's shirt with his teeth in a melee after Stoke midfielder Oghenekaro Etebo was sent off. "It might look a certain way but he hasn't bit me," said Allen. "He might have got a little bit of the shirt but nothing that I'm worried about and I don't think it should go any further that that." Both players were booked for their part in the incident. Sam Clucas had put Stoke in front before Etebo was shown a straight red card for a challenge on Richard Keogh. Harry Wilson equalised with a free-kick before Tom Ince got the winner for the 10-man home side, giving Potters boss Gary Rowett victory over his former club. The result meant Stoke moved up to 12th in the table, five points below the Rams.